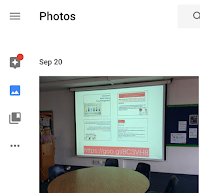 Google Photos is new (or at least vastly improved) and there are still lots of things that need work, but every day that we use Google photos at IGBIS we find new uses and innovate ways to save ourselves time and dramas. The automatic syncing is worth the effort of moving over all on its own. Once uploaded (or even better synced) the photos (or videos) are stored in one place, but there are at least five different ways to access or use your photos (for now). This makes it all very confusing so I recommend to all staff (especially staff who are not that competent) to use the Google Photos web app for at least three reasons. I don't know if Picasa web albums and Google+ photos will be maintained. The Web app looks the same as the iPad app, it allows you to do so much more and it is easy to use and share albums and photos. We used to use iCloud to automatically sync photos from teacher iPads and even some class iPads (all photos going to the teachers photos app) This didn't work for video, if a class or teacher took too many photos the free 5gb limit could fill very quickly and it was hard and time consuming to move the photos to our Google Apps (Blogger, Docs etc). If teachers had an Android phone this syncing wouldn't work. We have also set up class Google Accounts so that all the iPads in a class can be synced to the same account, this means students can see all photos and videos no matter what iPad they are on. It also means the teachers can access all the photos and videos the students take (we set up a Profile on Google Chrome with the class account). 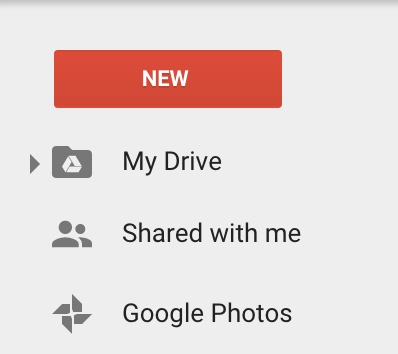 We can also log into the class account and share the Google photos folder directly with the teacher or students so they can have it on their own drives. With iPads this is great because 99.5% of everything students make on an iPad either ends up as a photo or a Video. 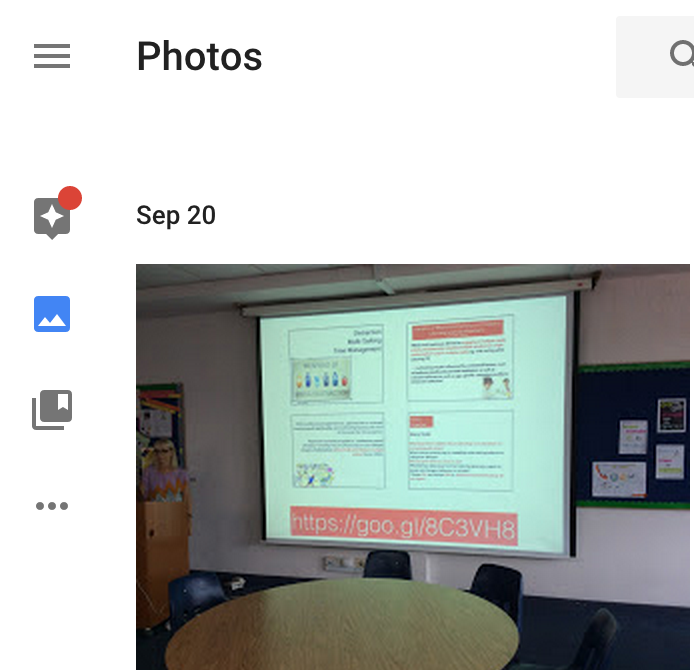 Teachers would drag photos from iPhoto (or Photos) onto their desktop then drag them into Google Docs or upload them to Google Sites or their Blogger blog. For videos they would have to plug in their iPads, import them into iPhotos, export the videos and upload them to YouTube. Everything is just there. Go to insert an image in a Doc, Slides presentation, Drawing or sheet and your albums are one of the options. 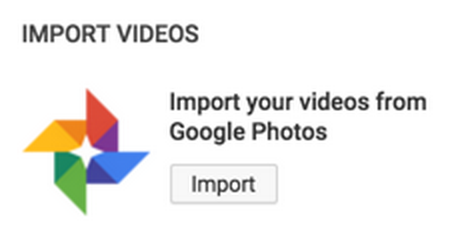 On a Google site, you can import directly using the Insert / Google+ for both individual photos and albums. The only issue with this is that photos have to be in an album before you can search for them. Now with automatic syncing (especially syncing class iPads to a single account) and easily using the photos (and videos) in all GAFE apps the task of using photos and videos in simplified and sped up. Teachers can also set up albums for each student in their class, then share the album with the parents or the students, once again to update photos it can be done on the App or on the Web. For camps we have set up camp websites with links to particular albums, once a photo is put in the Album it is automatically accessible from the Camp Site. As yet there is no way to collaborate on an album (like iCloud photo albums) so to get around this we have created Google Accounts for each camp and each iPad taken on camp will be logged into this account, this also means that all the photos taken on camp will be stored in one place, while teachers can choose the photos they want to share with the parents. 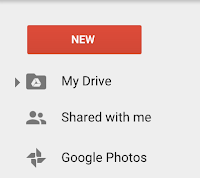 We are also testing students and teachers having direct access to the photos and videos in their Google Drive, we do this by sharing the Google Photos folder in a year level account with all the students and teachers in a year level, which they can then add to their drive. This is only the start of how we share photos, I am sure there are many more possibilities that will come to us as the year progresses. This was done in iPhoto and then maybe again on a Google Drive folder or using Picasa, teachers had to remember to update all the areas and photos were not always where you wanted them when you needed them. Videos were just as bad. With it all being done on Google Photos, in albums, it is much easier. Specialist teachers have albums for each grade level which contains all their photos and videos, this can easily be used to create portfolios or to share photos with the kids. They also then have a sharing album which they can share on class blogs or directly with the parents. 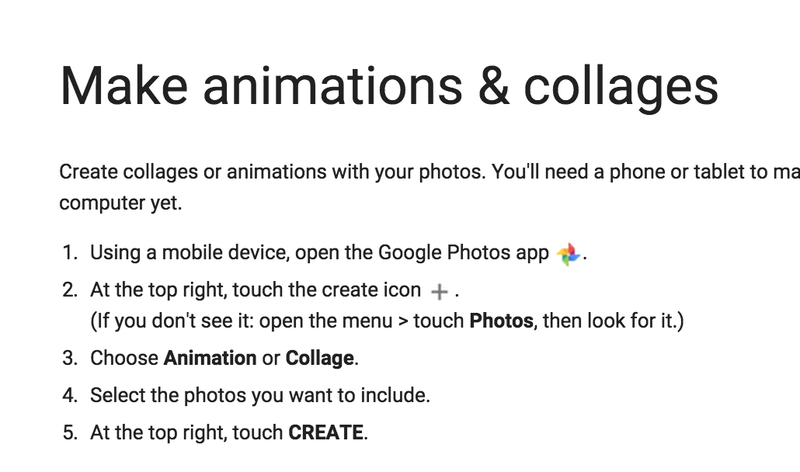 Built into Google photos (mobile app) there also have some great tools including the ability to use photos to make a photo story, a movie (you can add titles and music), a collage and a gif. These features are not on the web app. The Google photo assistant will sometime choose some of your photos and automatically make some of these things for you, but we find it is much better if the students or teachers can choose the images that go into the photo story or animation. Teachers are creating photo stories on the bus on the way home from excursions and then sharing them with parents (a two minute job) once they get back to school. If they are using their phone they can add them to their website while still on the bus. We are looking forward to the photo stories and videos that will be created and shared while the students are on camp in the coming weeks. Photos can also be edited directly on the web app or the mobile app including adding descriptions. Nothing is, some complaints include teachers and students have are having to download the photos to use in other apps, sometimes the videos created in the Google photos app don't upload and if you don't open Google photos the photos and videos don't sync. We feel though that Google photos has added a lot to our iPad program and the way we use photos and videos at our school, we are saving time, creating great products and have become much more collaborative. Our students make a lot of videos and photos on the class iPads (as do the teachers) pretty much everything they create ends up as either a photo or a video therefore we need an easy solution. - did I mention video is auto synced? 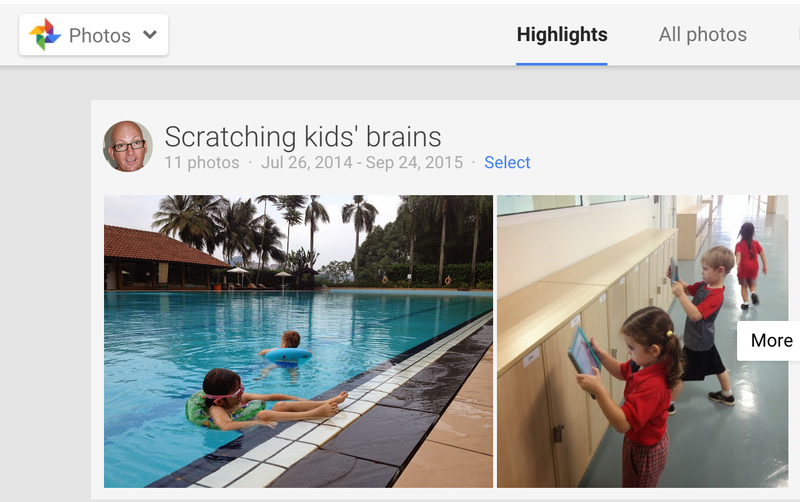 I would love to hear how others are using Google Photos in their schools.